The Case Western Reserve University men’s tennis team battled through bad weather to take four of the five brackets in the Kenyon Invitational doubles’ competition. The six Spartan doubles teams combined to win 26 of their 29 matches over the course of two days. Third-year student Anthony Kanam and second-year student Jonathan Powell won the “A” doubles flight after three tough matches. 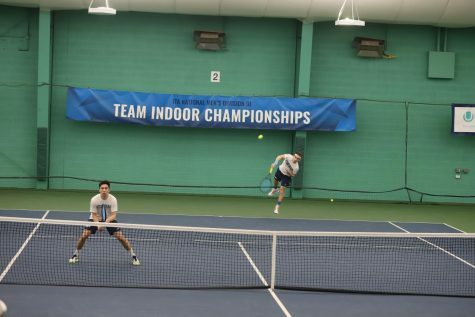 The duo triumphed over Kenyon College’s Jacob Zalenski and Austin Diehl 8-4 in the first round, then again over Nicholas Calzolano and Ray Boppana from Carnegie Mellon University (CMU) with a score of 8-5. Kanam and Powell took the flight with an 8-1 win over Kevin Brown and Blake Burstein from Denison University. Second-year student Matthew Chen and first-year student Chaitanya Aduru won their opening round in the “A” draw against Walsh University’s Jakob Riglewski and Pedro Campos 8-6, before narrowly falling to Denison’s Brown and Burstein 8-7 in the semifinals. Third-year students Sam Concannon and Zach Hennessey lost their first match in the “B” doubles flight but came back strong with an 8-5 win against Denison’s Brian Weisberg and Vlad Rotnov in the consolation finals. First-year students Aaron Umen and Max Vicario started their first collegiate tennis season strong, going 3-0 in the “C” flight. In their first round, Umen and Vicario beat fourth-year student Pako Alezivopoulous and second-year student Omar Santiagonunez Ahumada from Ohio Wesleyan University (OWU) 8-0. Fourth-year student Jesse DeWitt and first-year student Austin Hanna from the College of Wooster also lost to Umen and Vicario with a score of 8-2. The Umen-Vicario duo took the flight in their third round with an 8-3 win over John Carroll University’s Andy Siciliano and David Sinese. Third-year student Siddharth Rajupet and second-year student Earl Hsieh opened the “D” flight against Dawson Drummond and Clemens Wagner from Walsh with an 8-4 win. Their next win in the semifinals catapulted Rajupet and Hsieh into the finals, besting Kunal Barde and Clark Safran from CMU 8-1. In the finals, the Spartans duo narrowly defeated Denison’s Akshat Agarwal and Jacob Dennen with a score of 8-6. Fourth-year student Rob Stroup and first-year student Kenneth Boyette battled through the “E” flight to take the win. They took their opening match against OWU’s Grant Brooks and Billy Lewis with a stunning 8-0 score. In the semifinals, the Stroup-Boyette duo played Doug Moore and Jack Payne from John Carroll, winning 8-1 and advancing to the last round. The Spartans won the final against Mattias Mauviel and Henry Wessel from Kenyon 8-0. 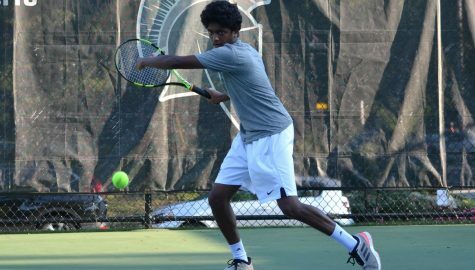 The Spartan men’s tennis team will play in the Cincinnati Collegiate Invitational and the Oberlin Invitational this weekend.